The conclusion: Won't you be my friend? When you're young, it's easy to make friends. You're doing nothing but hanging out with people at school, and you're forced into social interactions. When you're an adult though, and time becomes a more precious resource, it gets harder. So for the grand finale of my VR diary, I decided for the ultimate test of whether virtual reality can truly substitute for reality: making a friend. After a long, exhausting day, could the convenience of VR allow me to make friends from the comfort of my own home? First up, I tried to tackle something a little more familiar. Back in the early days of Xbox Live and PlayStation Network, I would roam multiplayer games and befriend total strangers. We'd play Wolfenstein or SOCOM: Navy SEALs together, have fun playing and then often become buddies. Why couldn't I just recreate this experience in VR? Plus, shared experiences are a quick way to make friends with people. Experiencing things together with someone else establishes a sort of bond. You already have something in common, so it's an easy bridge to a full conversation. So I downloaded Echo Arena, consistently ranked as one of the best multiplayer experiences in VR. I went ahead and tried to play with some folks, but it soon dawned on me that times have changed. There were no mature adults here playing games for fun, ready and willing to chat like they were back in the day. Instead I was met with a lot of shouting young people who started giving me a headache. Granted, maybe my memories of gaming past were a little rose-tinted, but this certainly wasn't the type of experience I was looking for. I next settled on Altspace VR, an app geared toward community and making friends. After I created my avatar, I decided to do what any person would do when joining a new community: check out community events. There was an improv event happening, so I figured it would be a great way to get loose with some strangers and have some laughs. Maybe I'd meet someone interesting. For a while, this is how it worked out. I watched as the two hosts called upon people, and it became quickly obvious that there were some regulars in the audience. They were gung-ho and actually quite good. I figured I'd hang back and observe before jumping in myself. Once the sketch was over (it was about being a passenger on an airplane with a snake, or something) I geared up to join in. The hosts asked for a clothing item. I began shouting "scarf" but I wasn't heard. Not because people were clamoring to have their say, but because one dude belted out "underwear!" They ended up going with a hat. Next, they asked what they should be doing with the hat. Cue the same guy yelling about doing some obscene acts with said hat. I wasn't going to make friends here. At least that was what I thought, until I decided to check out Altspace's The Campfire late one night. At about midnight. I went in and was greeted by a small group of people having conversations. The Campfire recommends talking points, and these people were actually responding to them. There was no immaturity here, just people chilling around a campfire and talking. I looked to jump into the convo, but they soon stopped responding to the talking points and started talking about this one guy's job. He worked in government dealing with hazardous materials, and was complaining about his work. It was pretty fascinating, but I was a little nervous to fully jump in and start talking to this guy (oh hey, just like real life!). And then it happened. Chaos erupted. One guy strolled right into the fire, which another person apparently thought was the funniest thing they'd ever seen. What ensued was about 10 minutes of pure hilarity. Everyone just started messing around this virtual campfire. It was weird, insane and absolutely hilarious. It was a good night. Confidence renewed, I started returning to Altspace for these little interactions. The next time I returned to the campfire, I found a group of people who seemed open to some company. They were heading to the user-generated content area (which is pretty much just as described) and invited me along. So I went. It was pretty clear that this group had known each other for a while, and they spoke of people and things in the community that went way over my head, but they were friendly and interacted with me. After a while I got exhausted and bailed, but I enjoyed our time together. Altspace tends to have a support member hanging around the campfire to help people out, so I decided to go up to her and see if I could get some tips. Funnily enough, what I found was another guy there also seeking some advice. He introduced himself and we started talking about the state of VR. After all, that was why we were here. We talked about the Oculus Go, and how he loved the quality of the Vive. I told him I was on the Rift, and we bonded talking about VR. He asked where I was from, I asked where he was from. We talked about work. It was a real, honest-to-goodness conversation. The support member was also fascinated by our discussion and joined in too. She was telling us how a lot of new Altspace members have Oculus Go headsets now, and then we bonded about how great The Void at Disneyland is. Eventually the first guy had to depart, so he bid us adieu and vanished. But not before sending me a friend request. I had done it. I had made a friend. It turns out that making a friend in VR isn't too different from making a friend in real life. All it takes is some effort and a desire to step outside of your routine for even a little while to put yourself out there. Just talk to people, go on weird adventures and stumble into something hilarious. My new VR friends have been telling me they've been able to parlay their VR friends into real-life friends. While they haven't met in person, they have talked on the phone and kept up with other "real-world" methods of communication. 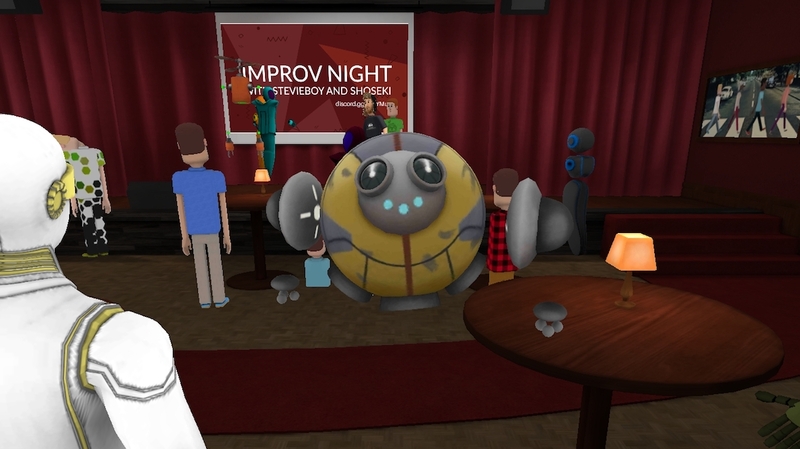 VR may be a totally different way to make friends, but it can be just as effective. Throughout this diary, I've explored how good VR is at replacing reality. And, no surprise, it depends on the activity. When VR is asked to step in and outdo immersive real-world experiences, like watching a movie or travelling, it falls on its face. But there are moments when VR gets out of the way, and lets you do the most human thing possible without any friction, whether that's learning to express yourself or simply communicating with your buds. VR may only be effective for a small handful of things beyond gaming, but I'm more convinced than ever of its potential.